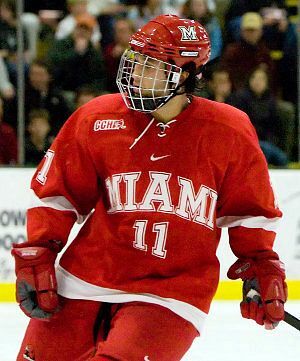 > Miami sophomore forward Carter Camper has been named to the 2008-2009 Reebok/ACHA Division I All-American squad. Selected as a member of the West Second Team, Camper scored 42 points this season for the RedHawks, with 20 goals and 22 assists. The Rocky River, Ohio native now has 83 points thus far in his Miami career and is well on his way to joining the 100-point club, with two years of eligibility remaining. Posted on April 13, 2009, in Carter Camper. Bookmark the permalink. Leave a comment.